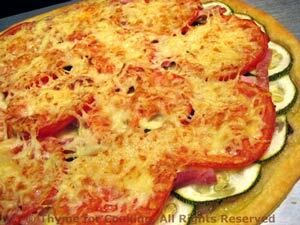 Easy Dinner from Thyme for Cooking: Tomato and Zucchini Tart. This is a cross between a pizza and a tart, and is both quicker and lighter than home-made pizza. The only (minor) problem is that the zucchini can give off a lot of liquid when cooked. Immediately after taking it out of the oven I cut a tiny slit in the edge of the crust, and tilted the pan, slightly, over the sink, to let the liquid drain off. That fixed the problem... But don't let the tart slip off! Using puff pastry rather than a traditional pizza crust gives a much lighter aspect to this, late-summer pastry. Cut everything very thinly, with a knife or food processor, 1/16th inch (.3cm), and don't be too generous with the cheese. Scoring a line around the edge of the pastry will help it puff up. Lay the puff pastry out on a baking sheet. With a dull knife (butter knife) lightly score a line around the pastry, 1/2" (1.25cm) from the edge, being careful not to cut all the way through. If your pastry is frozen you may have to wait until it thaws a bit. In a medium skillet sauté onion in oil until tender, about 7 minutes. Add thyme and stir to combine. Remove from heat until needed. 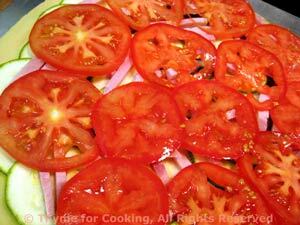 Thinly slice tomatoes, about 1/16th" (.3cm). You should get 8 - 10 slices from each tomato. Spread the onion on the puff pastry, staying inside the scored line. 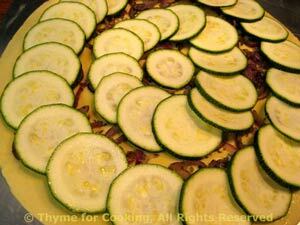 Lay the zucchini slices on top in 2, slightly overlapping circles. Spread the ham on top of the zucchini. Lay the tomatoes on top of the ham, touching, but not overlapping. Sprinkle with shredded cheese and Parmesan. Bake, 420F (210C) until edges of the crust are golden and vegetables are tender, 25 - 35 minutes. If zucchini has given off much liquid, score a slit in the edge and tilt slightly to drain.